The toothfairy seems to visit in bursts. One of our kids *just* lost TWO teeth. She is overjoyed. While *I* am the “tooth-fairy” we have a fun tradition. 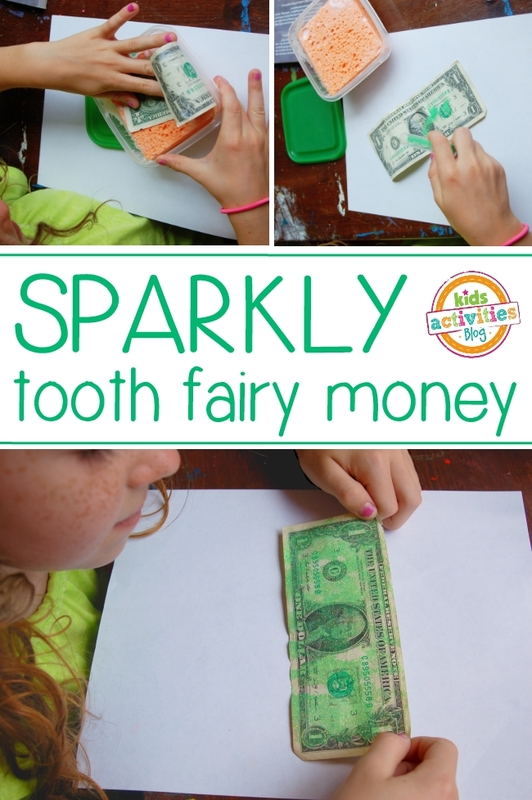 The child with the missing tooth gets to make their own “fairy” money. On our Facebook wall about a year and a half ago I asked for ideas of what to do as my gal was about to lose a tooth. Someone on there put up photos of their money. They used glue sticks and sprinkled glitter over the money so that it sparkled as if fairy dust covered it. 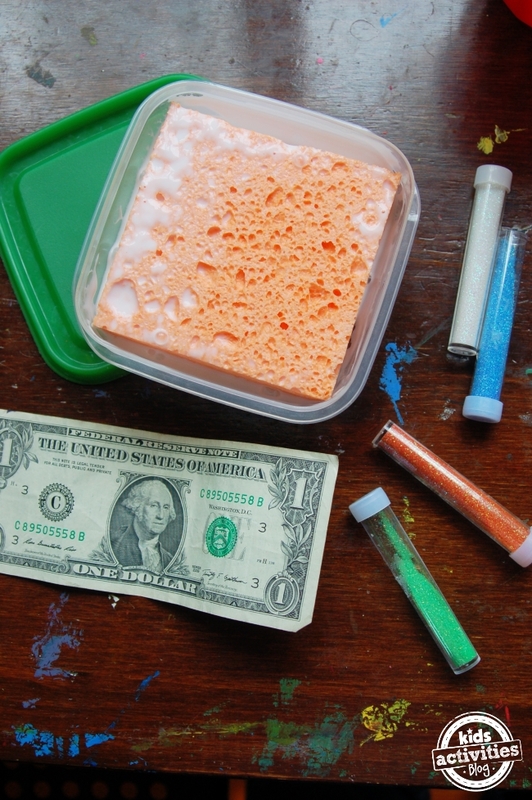 My kids wouldn’t let me play with glitter along, so they began making their own money. They cover it with glue and glitter, I hide it under their pillows in the night. We have fun! Our secret to getting the glue on the dollar evenly is our glue bucket. It is marvelous. Pour glue into a small tub and cut a wet sponge to fit into the container. The sponge will soak up the glue and you will have a large surface glue “stick” of sorts. This is better than our glue sticks (which are always dried out) and better than squeeze glue (which globs or little hands can’t use easily). Like that nifty glue trick?? Check out our other Craft Hacks for Kids.